Today we are going to explore two Johannesburg prefabs, from planning stage to execution. Designed by architect professionals, Pen Architectural Technologists these two homes are wonderful examples of how important planning is for architecture and what incredible structures can come about as a result. Planning is crucial to any good design, ensuring that the architects and the home owners are all on the same page. You will find it very interesting seeing how the plans materialise into reality! In this first design, we can see how the designers have planned a minimalist look and feel. They've gone for a white, black and grey facade, which looks very elegant and sophisticated. These three tones works beautifully together, contrasting with the manicured emerald green grass. 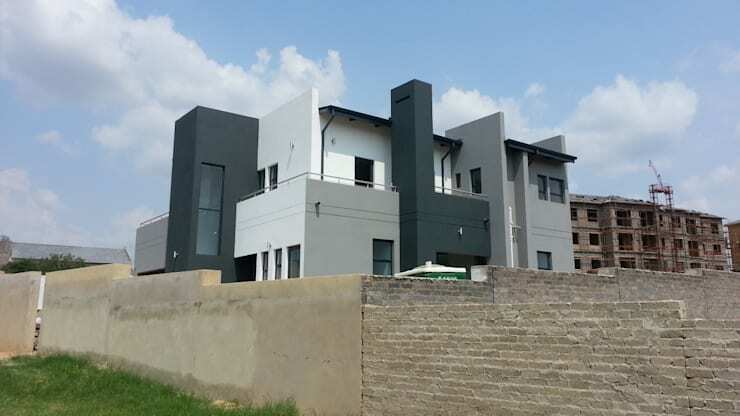 We can see that the designers have planned for a double-storey home, where the architectural structure takes on different volumes, shapes and dimensions. The black garage finishes off the look and feel, neatly packaging the facade. Don't you love the balcony on the upper level, which creates a wonderful space where the sunshine and fresh air can be enjoyed? This 280 square metre home, based in Cedar Creek Estate, also features a gorgeous swimming pool in the backyard. In South Africa, if you have a backyard, it's important to make the absolute most of the space available to you. A swimming pool is a great way to enjoy the South African climate, allowing for pool parties, games and entertaining. Have a look at these tips on what to know before building a swimming pool. In this image, we can see the building in its construction phase. Here, we can see how the newly built home looks exactly like the plan! This shows just how important it is to have a plan—there are no surprises for the home owners. The real architecture shows us how well the black, grey and white tones work with another. This is a very dramatic look and feel. In this home, nicknamed House Sam, we come across a 400 square metre home that is also in Cedar Creek Estate. 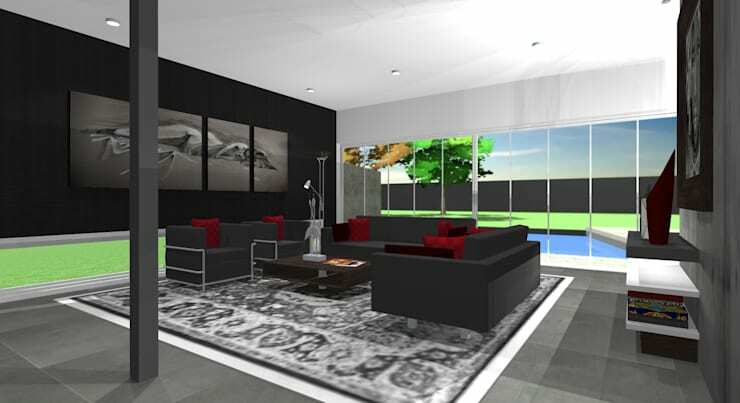 This is a beautiful home with even more fabulous interior designs. The home is expansive and grand, with a flat roof and a very modern design. The designers have planned a very neat and well-manicured lawn and garden that is very carefully organised. The interiors are the real star of the show, however. Would you like to see what's planned? In this image, we can see how the construction of the home is right on point in terms of the plan that we saw in the previous image. The grey tones are very savvy and sleek, while the building itself takes on different volumes and perspectives. 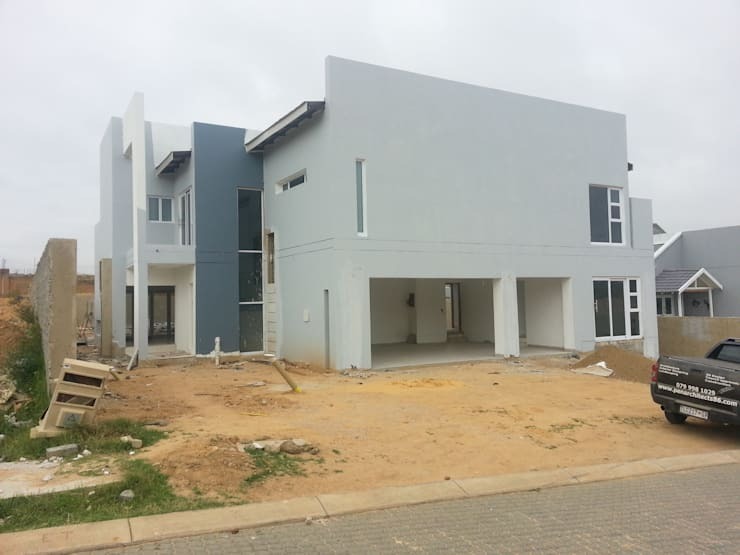 The double storey design is very grand in real life and we truly get a sense of how much space there is to work with! The bedroom plan is exquisite, with wooden floors and grey walls. It also features splashes of red colour throughout, which packs quite a punch. The designers have also introduced strong, geometric lines into the space. This adds texture and tone to the space. Don't you love the minimalist and trendy bed as well as the flat screen television on the wall? The designers have some great plans in store for this space! The living room is just as well-planned as the bedroom. It features large glass windows and doors throughout, which allow natural light to flow through this space. This contrasts beautifully with the dark charcoal and grey tones as well as the splashes of dark red. The designers also have grand plans for some beautiful artwork in the living space, which will bring charm and personality to the prefab. There are so many options when it comes to the interior design! In this image, we can see how well yellow works too! 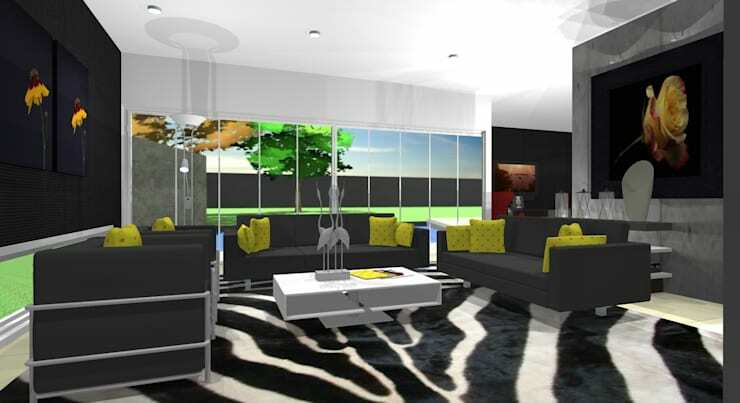 The zebra print rug is also bold and beautiful, fitting into the South African theme. Do you see how much fun you can have with your interior design? In this image, we can see how the designers have planned an open plan interior, allowing the rooms to flow into one another. The kitchen thus becomes a multi-functional space, where the family can relax and enjoy a more casual dining experience while mom and dad cook. 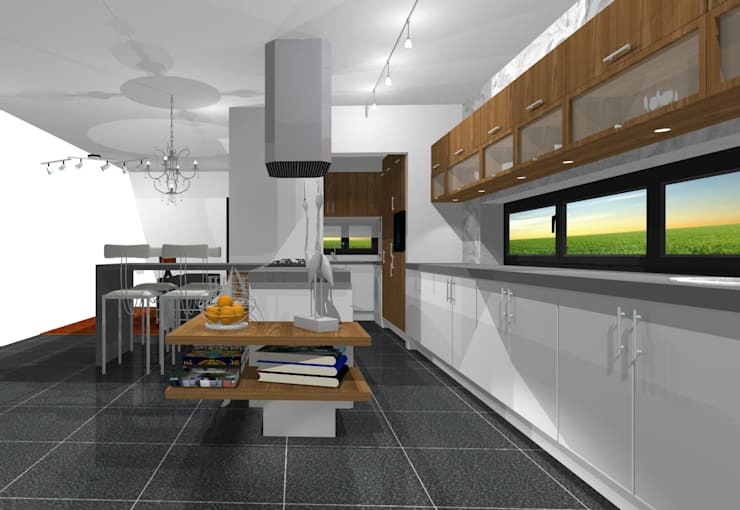 There is also plenty of storage space for kitchen items, ensuring that this kitchen can remain sleek and organised. You may also be interested in these 8 clever ways to improve storage in the kitchen. What do you think these impressive facades?